Also posted on the TalentCircles blog. We are all familiar with the litany of complaints: Companies can’t find skilled workers, schools are not providing the right kind of training, the government doesn’t let in enough highly skilled immigrants, prospective employees don’t want jobs at the wages that are offered, etc. If perception and scattered research might give some weight to such complaints, Cappelli demonstrates that they don’t add up when looked at holistically, and that they come across as urban myths. So what’s wrong? Job seekers and employers talk at cross purposes. Is it reasonable to expect job seekers to have done the work before because companies don’t want to train people? While it’s certainly valid to fear that a newly trained employee might go to the competition, it’s equally logical to wonder why a newly trained employee would leave… Maybe this was not the right hire in the first place… Maybe the very culture or a non-existent culture of the company is the problem. Is it reasonable to assume that filling a job vacancy is akin to replacing a part in a washing machine — what Peter Cappelli calls the “Home Depot Syndrome” — and assume that people are mere cogs in the industrial machine? This may not be the safest angle to increase a company’s productivity or creativity, or to even motivate people to join a company. Cappelli mentions two major problems: The first one is the automated software used to filter job seekers — it allegedly complies with the mandate of equal treatment of all candidates, yet ends up generating pervasive unfairness: people can’t find jobs even though there are millions of open positions. How long will the legal requirements be an excuse for using antiquated software? The second one is the loss of power of the HR function: “Not coincidentally, the United States has the weakest human resources in the industrialized world.” The ultimate call is certainly to re-empower human resources, and re-empower recruiters —give them a strategic role. Brain drain is the death of companies, and so is brain blindness: “Millions of unfilled jobs are costing the economy billions of dollars in lost business,” reminds Cappelli. This little book is a powerful eye-opener. 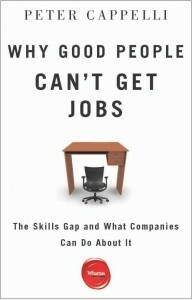 As I was reading through it, it seemed to me that what is initially presented as a sort of standoff between job seekers and employers may not be that willingly created by employers, and may raise a broader question about the ability for established companies to realize that economic survival in a global economy is more about building and nurturing talent and less about “filling” positions. The vast majority of the people who look for the perfect match today would not be hired in their own company. They benefited from a system when trust in people and intra-entrepreneurship mattered, which is the deep history of this country: the US started the modern industrial revolution thanks to millions of “unqualified” people — and Cornelius Vanderbilt left school when he was 11. I completely agree that the skilled worker complaint is an urban myth in this country. The truth is there are very qualified people who are willing to work, but not necessarily at the wages that some outsourced employees are willing to work at. I see this all the time in the tech industry, where our jobs are be outsourced overseas to individuals who are overqualified but willing to work for scraps.